For the second time in three seasons, the Doenges Ford Indians are champions of the Glen Winget Tournament. A spectacular and crisp double-play from Grant Yardley and Harold Borg to Braden Beasley ,sealed a 5-4 victory for the Indians over Kickapoo, Missouri on Saturday evening. The double-play wrapped up the championship and a teeth-grinding day of baseball for Bartlesville, which won two one-run games to take the title. The Indian's had beaten Mountain Home, Arkansas 4-3 in their semifinal game to advance to the title match against Kickapoo in the evening. The title game was filled with ups and downs for Bartlesville (18-10), which had numerous chances to put Kickapoo away. 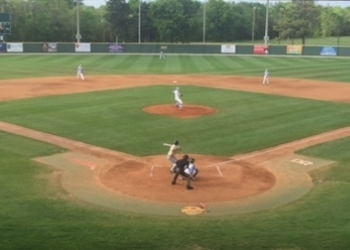 The Indians left 10 runners on base through their first five innings, including a bases-loaded and no-out opportunity where Bartlesville failed to score a run in the third. B'Ville also left the bases-loaded in the first. However, the Indian's did just enough. Stellar pitching from Randsom Jones, Kyler Hancock and Noah Yearout held down the Kickapoo lineup. Hancock got the win, while Yearout picked up a six-out save. It looked as if Kickapoo might tie the game, or take the lead, in the seventh. A lead off single, followed by a Yardley error, put Chief runners at the corners with one out – that is when Yearout induced the championship-winning double-play and complete redemption for Yardley, who had to range to his right to begin the twin killing. The Bartlesville bats finally came alive in the bottom of the fifth. The Indian's scored three runs on four hits. Andrew Harden and Borg singled to begin the frame. Cole Ellis doubled in a run, John Cone had an RBI single and Yearout got an RBI on a sacrifice fly. The only runs Bartlesville had scored previously were two unearned tallies in the bottom of the second. This is the first time since the 2002 and 2003 Indians that Bartlesville has captured two Winget titles in such a short amount of time. Bartlesville won the 2016 Glen Winget by one run also, over Ft. Smith, Arkansas. Braden Beasley was named Tournament MVP after picking up two wins on the mound and two doubles three RBIs at the plate throughout the Winget. Cone, Borg and Yardley were also named to the all tournament team. Bartlesville is next scheduled to go to Three Rivers on Wednesday for a double-header.